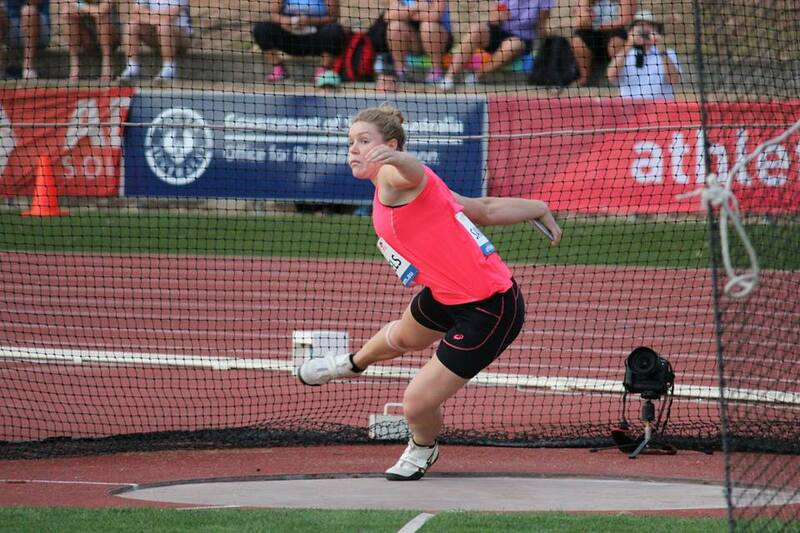 Australian Dani Samuels (NSW) has finished third in the women’s discus throw at the opening meet of the 2015 IAAF Diamond League series in Doha, Qatar overnight, while Sally Pearson (Qld.) has come fourth in the women’s 100m hurdles. Samuels, who won the Commonwealth Games gold medal in Glasgow last year, finished third with a best throw of 64.45m behind victor Sandra Perkovic of the Czech Republic, who won with her fourth round effort of 68.10m. Nadine Muller of Germany was second with 65.13m. Samuels earned one Diamond League point for her efforts in finishing third. The Australian opened with a first round attempt of 58.52m before Samuels sailed the platter out to 64.45m in round two to record her second longest throw of 2015 thus far. She followed that up with a 60.42m effort in the third round before fouling her three remaining throws. In the women’s 100m hurdles in Doha, Sally Pearson started well but couldn’t hold on and finished in fourth place in a time of 12.69 (wind +0.9) against a hot field. American Jasmin Stowers set a new world lead for 2015 and a Diamond League record of 12.35 to win the race and become the seventh fastest of all-time in the process. Another American, Sharika Nelvis, set a new personal best to finish second in 12.54, with Tiffany Porter of Great Britain (12.65) just beating Pearson into fourth at the line to exact some small measure of revenge for her defeat at the hands of the Australian at last year’s Glasgow Commonwealth Games. Meanwhile Madeline Heiner (NSW) celebrated her 28th birthday by moving up into third place on the Australian all-time list for the women’s 3000m steeplechase after running a huge new personal best of 9:28.41 to finish in sixth place in Doha. Heiner was with the leaders right until the final lap before Kenyan Virginia Nyambura kicked away to the win in a 2015 world leading time of 9:21.51. Heiner, who has already earned herself selection for the Australian Flame to compete at the IAAF World Championships in Beijing (CHN) in August, smashed her previous best time of 9:31.03. In the men’s javelin throw a fourth Australian, Hamish Peacock (Tas. ), also performed well, finishing in seventh place with his best throw of 81.66m. Peacock has been searching for a throw of 82.00m or more this season in order to qualify for the World Championships and he came ever so close with just his first throw in Doha. Peacock hurled the spear to 81.66m with his opening effort to lead the competition at the end of round one. He could not improve on that effort however as Tero Pitkamaki of Finland took out the event with a new 2015 world leading mark of 88.62m. The meet in Doha was the opening round of the global IAAF Diamond League series which includes 14 events in cities around the world. In total 12 reigning Olympic champions and 11 current world champions got their 2015 IAAF Diamond League campaigns underway in Doha. Round Two of the IAAF Diamond League will be held in Shanghai (CHN) on Sunday evening Australian time. Three Australians are set to compete in Shanghai, with Alana Boyd (Qld) lining up in the women’s pole vault and Kim Mickle (WA) and Kathryn Mitchell (Vic) both on the start lists for the women’s javelin throw. To see full results from the Doha IAAF Diamond League meet click here.